When Sean Eberle volunteers at the Ronald McDonald House (RMDH), it hits home. That’s because as a child, Sean himself was a patient at the RMDH. “Any time you can give back to somebody who’s given back to you,” you have to take that opportunity, Sean says. Knowing Sean’s background, he invited Sean to come volunteer at the RMDH, where Chirag was already volunteering as a Project Leader for the Activate Good Triangle Do-Gooders MeetUp group. “I was so familiar with it from staying there so many times,” Sean says. Sean and Chirag regularly help out in the RMDH kitchen to prepare a meal for more than 70 kids. Though he says this RMDH operates somewhat differently from the one he went to in his youth, he still remembers how volunteers used to cook for him and his family, and how much it helped them financially. 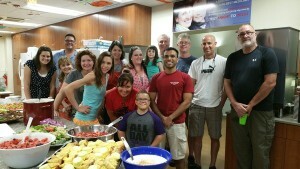 Chirag and Sean (front and center; fourth and fifth from the right, respectively) volunteering at RMDH. “It seems so simple and small to some people, but when you’re juggling surgeries, recovery, appointments, driving to the hospital. You’re going to drive a long distance to get there at night and not know if you’re going to have a room… As serious as some people are, or as I was, or my brother even — to not have to think about that stuff, it takes a weight off your shoulders,” says Sean. Ultimately, “we’re there to uplift people going through different situations,” Sean says. He and Chirag bring a “positive attitude and positive energy,” both because of their friendship and because they like to have fun. “We both love to give back,” he says. If you want to start giving back to your community, learn how at www.activategood.org, or browse opportunities here.